The Revolution is designed with the outdoors and the different types of terrain in mind. It is also designed with YOU in mind, whether you’d like to go jogging one day or take your baby on a nature walk on the trail the next. BOB realizes that all kinds of parents love the functionality of the Revolution, so they added a few more features to their basic SE model (no longer available) and called it the BOB Revolution Flex and Pro. These two became so popular that the older SE and CE models have been faded out. I’ll show you the differences between the Flex and Pro in a moment, but first, let’s go over the basic features that both share. 3 What age can my child ride? 7 Tell me about the sun canopy. 9 What accessories can I buy? What is the difference between the BOB Revolution Flex and Pro? They are minor, not that different from the SE, the most popular. The Flex and Pro both a 9-position adjustable handle bar, from 34-45 inches high. The Flex and Pro have different colors, and the Flex has the option of a black frame. The Pro has a hand-operated drum brake for serious runners, to help them slow down on hills. The video below gives you a side-by-side comparison. 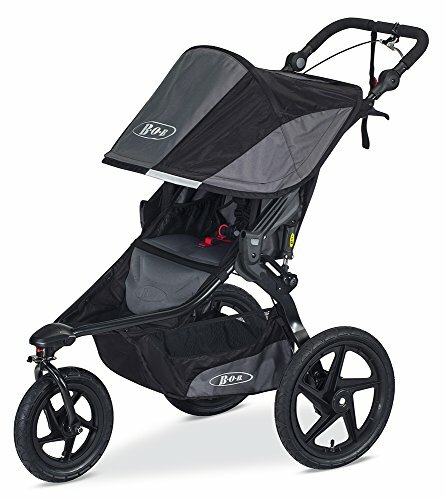 Now for the features and benefits that all the BOB Revolution stroller models offer. What age can my child ride? You can use your new BOB with your newborn baby, but they’ve got to be in a car seat. The seat that matches your stroller’s colors is the BOB B-Safe car seat by Britax, as shown in the photo. 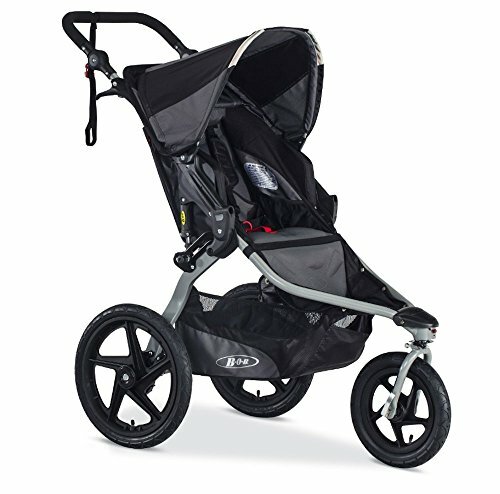 All BOB strollers accommodate car seats including brands like Graco, Chicco, and Peg Perego. Recent improvements make it easier to install the car seat adapter accessory, so you can turn this versatile stroller into a travel system. Different brands require a different adapter, and BOB’s site shows you which one you should get. BOB recommends that babies be at least eight weeks old to ride in the Revolution if the car seat is not used. If you plan to jog, your baby needs to be six to eight months old before doing so, without the car seat.Your baby needs to have the muscle strength in the neck to hold his or her head up unassisted. Your child sits in comfort in a padded multi-position reclining seat, which has been redesigned to give better support. An improved 5-point safety harness provides better adjustability for a more secure fit as your child grows. I love the fabric on the current year model; an improved heat-pressed foam padded Poly and Dobby weave fabric is water resistant yet firm for posture and comfort. The seat can recline almost flat, and extra Safari Flaps in the back hangover, protecting your sleeping passenger. Safety also ensures baby’s well-being, and this stroller comes equipped with both foot breaking and a wrist strap so that you never lose contact. This gives me such a sense of peace! I’m impressed with the adjustable suspension system with settings for both big kids and little ones, and I think you will be too. Set the stiffer suspension for less weight and looser suspension for a heavier child. This assures a smooth ride over all kinds of rough terrain no matter what your child’s weight. 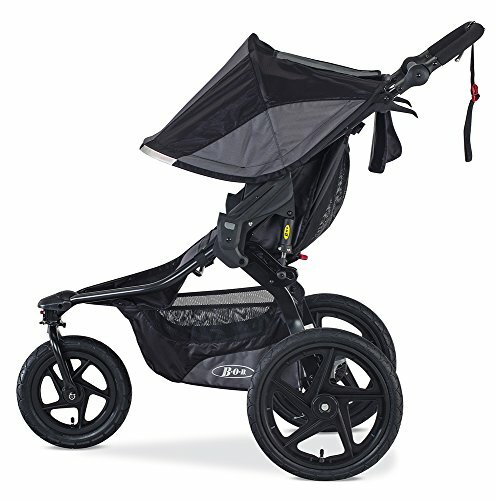 The front swivel wheel is the key; it locks into place for times you want to take off on a jog with your baby or it unlocks to swivel for tight maneuverability around corners or crowds. Use the tracking knob when the front wheel is in the locked position if your stroller starts to veer in one direction or another. Swivel or straight, the choice is yours, and parents rave about this feature that allows them so much freedom in one product. The Revolution is easy to maneuver, with the ability to turn on a dime and easily push with one hand if necessary. When going for a test run, it was easy to control with just one hand. It was actually fun! Mom and Dad can take their child with them everywhere in the great outdoors because the Revolution can take the terrain like a champion. This is hands-down one of the best all-terrain stroller on the market. 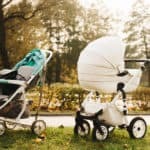 This stroller is designed for infants and children up to 70 pounds, and if you have two children, you can get the BOB Revolution Duallie, which allows for two kids up to 50 pounds each to ride. You’re going to be absolutely amazed when you see the newly redesigned sun canopy – it is one of the best I’ve seen. 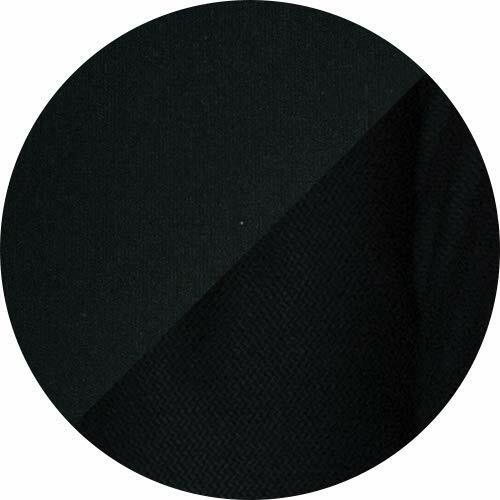 It’s enormous now with a 125° range of coverage to keep your child shaded no matter what the sun angle is. One mom says that when the canopy is fully extended it keeps out the low evening sun from her daughter’s eyes. Spring action in the canopy hinges makes adjustment very easy. One customer named Amber writes about how much she likes the spring action in the hood because it allows her to have several different positions and is easier to close back up. Velcro tabs secure your canopy in the back position so it won’t flop forward. Keep in constant contact with your little one with the large peek-a-boo window and tuck in the flap with a discreet mesh pocket at the top of the top of the window. Your Revolution always looks well put together and neat. I love that! The adjustable handlebar has nine positions so that you can find just the right height for your comfort. The handle sticks out rather far so that tall parents won’t kick the back while taking long strides. I think the padded bar is thick and comfortable and will wick away sweat so that you keep a firm grip. A busy mom said in her recent 5-star review that she is 5’2″ and her husband is 6’3″ they can both use their BOB Revolution Flex without any issues. A storage basket underneath the seat has side pockets for the little things you or your child would like to bring along. You also get a small storage pocket at the back of the seat, which I find to be quite handy. One reviewer says she can keep a small change of clothes, diaper, pad, and wipes. She doesn’t need to bring her diaper bag with her at all. Fold up your Revolution with ease when you’re finished and use a strap and clip to secure the stroller in the folded position. How convenient! BOB has lots of goodies you can add to your Revolution to make your outings an incredibly pleasant experience. 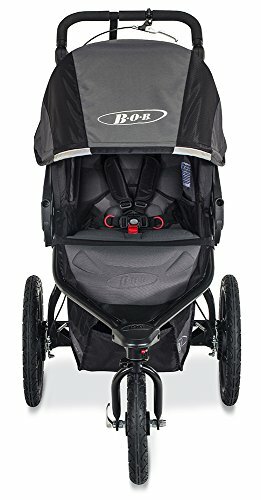 The most popular accessory I see customers buying with their BOB Revolution stroller is the handlebar console, for single strollers which you see at the right. It has two bottle holders and a zippered compartment in the middle to keep your small items. Parents recommend this, as it’s gotten very high marks! This particular one includes a tire pump, but if you want just the console, that is also available. Obviously, the customer base for BOB products are people who like to get outdoors and spend a bit of time exploring nature and getting fit. 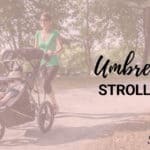 So you clearly need a stroller equipped to handle all sorts of weather to protect your child. Purchase the weather shield where your passenger stays warm and dry. This shield is also ventilated so it doesn’t get all stuffy in there. On those hot summer days with bright sun, you’ll want to make sure your child has full protection with plenty of cooler shade. The specially designed mesh on the BOB sun shield reduces harmful ultraviolet rays as well as bugs and wind. Then on cold winter days, line the seat with the Warm Fuzzy, a plush pad that keeps your child cozy and toasty. Parents who want a go-anywhere, sturdy and safe stroller will prefer the Revolution Flex or Pro and they love it. Reviews for the BOB Revolution stroller have been pouring in with lots of positive feedback. The average rating for the new model is very high! The Revolution receives the most positive feedback about its performance all types of terrain from trails, sandy beaches, grass, mud, sidewalks, shopping malls, you name it. Customers found the-handed maneuverability a huge plus, with parents experiencing the quality of this product personally. Revolution owners from previous years love the durability, saying it lasts for years. They love how easily it folds and how compact this item is for keeping in the car or in storage. Parents also love the fact that the wheels come off for even more compact storage. Some have taken theirs on airline flights with no problem while others didn’t want to take a chance that their beloved BOB would get lost in baggage. 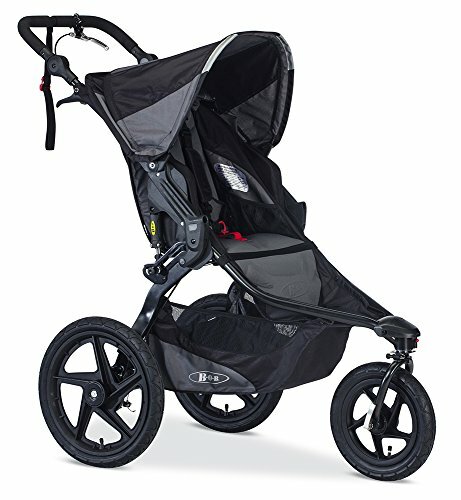 Consumer Reports has rated the Revolution in its list of all-terrain strollers fairly high, with good marks for off-road maneuverability and safety, a very good mark for ease of use, and an excellent mark for maneuverability. Complaints are few, but there are some. For one, the safety harness buckle could be more child proof – one press of the button and your older toddler can escape. The safety tether wrist strap is now on the handle instead of the lower axle and if you fall during your jog, you risk tipping your stroller backward. The strap is also fastened to the right side of the handle, which is not going to work well with left-handed people. Some owners were confused with assembly and stated that the instructions were far too complicated. Can you imagine yourself pushing this stroller around with your family?